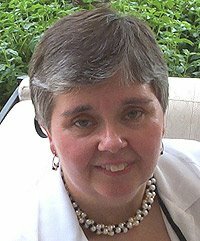 Amy Dickinson is the author of the syndicated advice column, "Ask Amy". She's also a daughter, a mother, a sister, niece, and cousin. And, she's lucky enough to be all of these in the small town of Freeville, New York, population 458. The Mighty Queens of Freeville, subtitled "A Mother, a Daughter, and the Town that Raised Them," is Dickinson's memoir, a story of women, and love. Dickinson was as unlucky in love as the rest of the women in her family. "In my family, the women tend to do the heavy lifting while the men - well, the men are nice and fine and they love us for a time." Her husband left her when their daughter, Emily, was only two. She and Emily might have lived in Washington, D.C., and, later, Chicago, but Freeville was always their refuge, the place that was the home of their hearts. Although Dickinson says she and Emily raised each other, she knows she wouldn't be the advice columnist, and woman, she is without the support of those family members who meet for breakfast every Wednesday morning to share their lives and love. 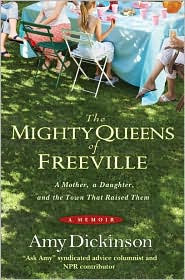 The Mighty Queens of Freeville is a quiet memoir. Even Dickinson's divorce was amicable. The humor is quiet, and sly. When Dickinson talks about her father abandoning the family, she says, "One advantage to actual abandonment is that it cuts down on marital discord. In order to fight with my father, my mother would have had to locate him first." In some hands, this could have been a bitter book. Instead, it's an insightful, quietly triumphant story. Dickinson accepted her lot in life, realized she had a family that would always be there for her, and moved on after her divorce. She had strong role models in the family. This book tells of two women who found their way home. It was wonderful to read a memoir that wasn't tragic. Yes, Dickinson's father abandoned the family, and, later, she was divorced. But, she found life after these episodes. And, Amy Dickinson shows that she, and her family, have earned their place as The Mighty Queens of Freeville. The Mighty Queens of Freeville: A Mother, a Daughter, and the Town That Raised Them by Amy Dickinson. Hyperion, ©2009. ISBN 9781401322854 (hardcover), 240p. I have it in my TBR pile and am looking forward to reading it now. I agree that I have had my fill of tragic memoirs for the moment. This is one that will make you feel hopeful when you finish it, not as if you went through a wringer.